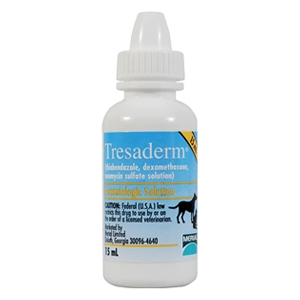 Tresaderm, 15 mL is a prescription-strength topical antibiotic, antifungal, and anti-inflammatory solution used to treat skin and ear infections in dogs and ear infection in cats. Bacterial dermatitis, otitis externa, and fungal infections are treated by Tresaderm pet medications. Please Note: This product by Merial Limited, Duluth requires overnight expedited shipping and ships Monday through Thursday. During summer months, the purchase of 1 or 2 additional ice packs is advised. You can order the Tresaderm, 15 mL, antibiotic for pets and other pet drugs online. At our Texas based pet pharmacy online, we offer discount pet meds. We care for your pets and offer high quality pet medication! Federal (U.S.A.) law restricts this pet antibiotic medicine to use by or on the order of a licensed veterinarian. Dermatologic Solution TRESADERM® (thiabendazole, dexamethasone, neomycin sulfate solution) contains the following active ingredients per mL: 40 mg thiabendazole, 1 mg dexamethasone, 3.2 mg neomycin (from neomycin sulfate). Inactive ingredients: glycerin, propylene glycol, purified water, hypo phosphorous acid, calcium hypophosphite; about 8.5% ethyl alcohol and about 0.5% benzyl alcohol. Dermatologic Solution TRESADERM is indicated as an aid in the treatment of certain bacterial, mycotic, and inflammatory dermatoses and otitis externa in dogs and cats. Both acute and chronic forms of these skin disorders in pets respond to antibiotic treatment with TRESADERM. Many forms of dermatosis are caused by bacteria (chiefly Staphylococcus aureus, Proteus vulgaris and Pseudomonas aeruginosa). Moreover, these organisms often act as opportunistic or concurrent pathogens that may complicate already established mycotic skin disorders, or otoacariasis caused by Otodectes cynotis. The principal etiologic agents of dermatomycoses in dogs and cats are species of the genera Microsporum and Trichophyton. The efficacy of neomycin as an antibacterial agent, with activity against both gram-negative and gram-positive pathogens, is well documented. Detailed studies in various laboratories have verified the significant activity thiabendazole displays against the important dermatophytes. Dexamethasone, a synthetic adrenocorticoid steroid, inhibits the reaction of connective tissue to injury and suppresses the classic inflammatory manifestations of skin disease in dogs and skin infection in cats. 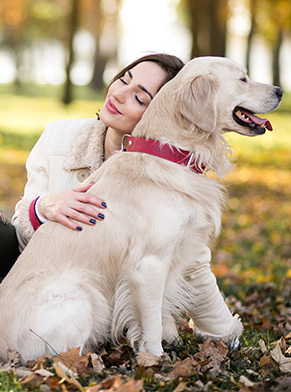 The formulation for TRESADERM topical antibiotic combines these several activities in a complementary form for control of the discomfort and direct treatment of bacterial dermatitis and otitis externa in dogs produced by the above-mentioned infectious agents. Application of TRESADERM, an antibiotic for pets should be limited to a period of not longer than one week. On rare occasions dogs may be sensitive to neomycin, a key ingredient of this topical antibiotic for dogs. In these animals, application of the dog medicine will result in erythema of the treated area, which may last 24 to 48 hours. Also, evidence of transient discomfort has been noted in some dogs when the pet antibiotic medicine was applied to fissured or denuded areas. The expression of pain may last 2 to 5 minutes. Application of Dermatologic Solution TRESADERM should be limited to period not longer than one week. While systemic side effects are not likely with topically applied corticosteroids, such a possibility should be considered if use of the antibiotic solution is extensive and prolonged. In case you notice signs of salt and water retention or potassium excretion (increased thirst, weakness, lethargy, oliguria, gastrointestinal disturbances or tachycardia), treatment should be discontinued. Also, appropriate measures should be taken to correct the electrolyte and fluid imbalance. Store this pet medication in a refrigerator 36 – 46°F (2 – 8°C). This antibiotic for pet is for topical use in dogs and cats. The Material Safety Data Sheet (MSDS) contains more detailed occupational safety information. To report adverse effects in users, to obtain an MSDS, or for assistance call 1-800-672-6372. Product 55871 – Dermatologic Solution TRESADERM Veterinary is supplied in 7.5 mL and 15 mL dropper bottles, each in 12 bottle boxes. TRESADERM is a registered trademark of Merial.